It’s now been six months since Buckshot’s passing, and I still miss him terribly. The first few months were a blur of tears, sadness, disbelief at losing my riding partner, friend, light of my life, Buckshot. I printed out many photographs of him and put several in frames around my house. I created a thick scrap book of many of his photos as well. Sometimes I just look through them and remember what a wonderful horse he was. I looked on the internet for help about losing a horse and found some comforting poems that I printed out and read occasionally. I think he is in heaven with my mom (who passed away fifteen years ago) and a sister I lost last year. I love the poem about the Rainbow Bridge and envision he is there as well. Sometimes I look at the sky and know he is up there, cantering around happily. I kept going out to the farm he lived at, on Saturdays, with my other sister. And after a few weeks I rode a school horse, but after just a few minutes, my tears started and I got off of him. I waited a few more weeks and was able to ride a school horse and do okay. I brought all of Buckshot’s tack and gear and tools home – that was a sad thing for me to do but I had to do it. Now my second bedroom looks like a tack room . I know that I am still grieving him and so don’t want to look for another horse yet. At some point, I’ll know when I ready to do that, and I think I will. Loving Buckshot, looking after him, fussing over him, the absolutely wonderful bond and relationship that we had, and how wonderful it was to ride him, was a gift and treasure to me. And maybe I’ll have something akin to it again with another horse. I really loved him and I loved that he was my horse. And he was such a treasure to me. I valued my time with him so much. I have kept riding horses since his passing. For a few months, as I mentioned above, I rode school horses at the farm I boarded Buckshot at. But I knew that I wanted to go somewhere else. Partly due to my memories of him there, it was never the same there after he died. So I found a new riding stable much closer to my home, where I have riding lessons now. They have a lot of good school horses, and have adult riding classes, and they offer leasing and boarding, in case I want to do that in the future. They teach hunter jumper, which means I have transitioned from riding western to riding English. I have an English saddle that I bought years ago when I first got Buckshot. So I dusted off this saddle and took it with me to the new stables. I have gotten breeches, and paddock boots again, and also some bicycle shorts I wear under my breeches to pad that area (a great idea that has helped me a lot). The other students are very nice, the instructors are very nice, and I am relearning English equitation and have even learned to do some beginner jumps! Imagine, me, at 57 years, I have now jumped horses! I think Buckshot would be proud of me! And he taught me a lot, so it is an extension of his training. He taught me a lot- how to trust your horse, and because of that, to have self confidence, how to treat your horse with gratitude and dignity and attention, and if you’re lucky, your horse will respond to you. I think that in the months to come, I will realize even more about what Buckshot taught me while we had our five years together. But it is taking me a while. I’m not hurrying myself, or trying to “get over it” or “move on with things” because I realized shortly after Buckshot died how huge a loss it was for me. So I have been moving slowly, enduring the sadnesses along the way. And remembering what a sweet, wonderful horse he was (and is, in the heavenly pastures). And I am also growing a little bit, learning English riding, and getting to know some very nice new people and horses. I’ll try to write more on my blog going forward. But for now, thanks for listening…. Thank you for your kind words of comfort. I have been grieving Buckshot tremendously and it is a very difficult thing for me. The suddenness of his death, without any preceding illness, or even being "out to pasture," is one thing that makes his death very hard for me. In addition, he was the light of my life, one of the best and most wonderful aspects of my life, and his loss is huge. So I am trying to find comfort and holding onto the memories I have of Buckshot, and navigating the hard, slow, dark road of grief. I will be taking a break from my blog for the time being. Thank you. I don’t know how to write this. I am in shock and grief. My beloved, sweet Buckshot died yesterday. It was colic, severe colic and there was nothing that could be done. I can’t believe it. I can’t believe he is gone. I am shattered, stunned, crying, sobbing off and on. I hardly can move my fingers to type. It came on quick, as you probably know colic does. Wednesday night he had a tummy ache, and the BO gave him banamine. By Thursday it was severe, the vet called and determined how very severe it was and on Thursday he was euthanized. I was there and got to hug him and say goodbye to him and cry on his neck. He was buried in his pasture, by the persimmon tree. I can’t bear right now to go over the timeline or the details, as they are too fresh and raw. I am filled with a huge deep chasm of pain and sorrow over my sweet Buckshot. He was the most wonderful, patient, kind horse and the very best horse for me. I had him for just over 5 years. I loved him so very much, always saying to myself he is the light of my life. I adored him. I know he was old, at least or around 25 years old, but I wanted another 10 years with him, at least. And the suddenness of it is hard to bear. Riding him just last Sunday, and four days later he is gone. My tears are starting again. My heart, so filled with love for this most wonderful horse, is breaking apart with losing him. I will miss him and his dear personality so much. I’ll share more thoughts and memories later. Reinsman Tacky-Too Contour Navajo Pad - great for my swayback horse! What are your favorite tack items? How to describe myself? A horse lover (my passion), a writer (my hobby), an accountant (my occupation), in my fifties, single, living in Virginia, with a wonderful horse (Buckshot) boarded on an idyllic farm. 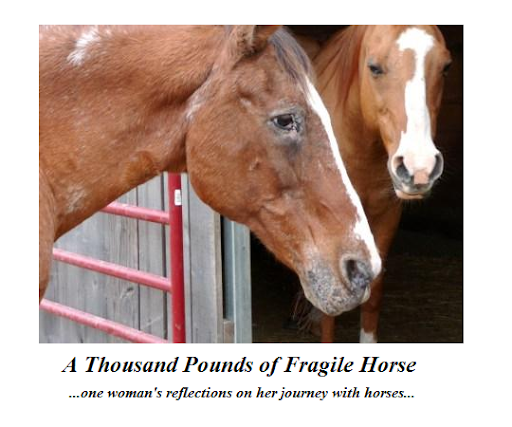 I enjoy reading, hate housework, savor moments with horses and adore all things equine! I have been riding for seven-plus years, continue to take lessons and continue to learn all that I can. This is my first blog, so please forgive any mistakes and mishaps! All materials are copyrighted by athousandpoundsoffragilehorse.com. Watermark theme. Theme images by Jason Morrow. Powered by Blogger.